I love the look of patchwork. You can tell when you look at the finished product that someone put lots of love and time into making the special piece – from fabric selections to the actual patching of pieces together. It’s a thing of beauty. But, boy, it’s hard work! Maybe I lack the attention to detail, but I often find myself sewing these little pieces together, only to find out that I miscalculated the measurement and the pieces come out way off. There’s nothing more disappointing than realizing that two patchwork panels that you were supposed to put together for a bag, for instance, don’t fit perfectly on top of each other! I have so much respect for quilters and other crafters, who have the patience and the skillful hands to put together amazing masterpieces. Runners put on running shoes and hit the pavement to train. 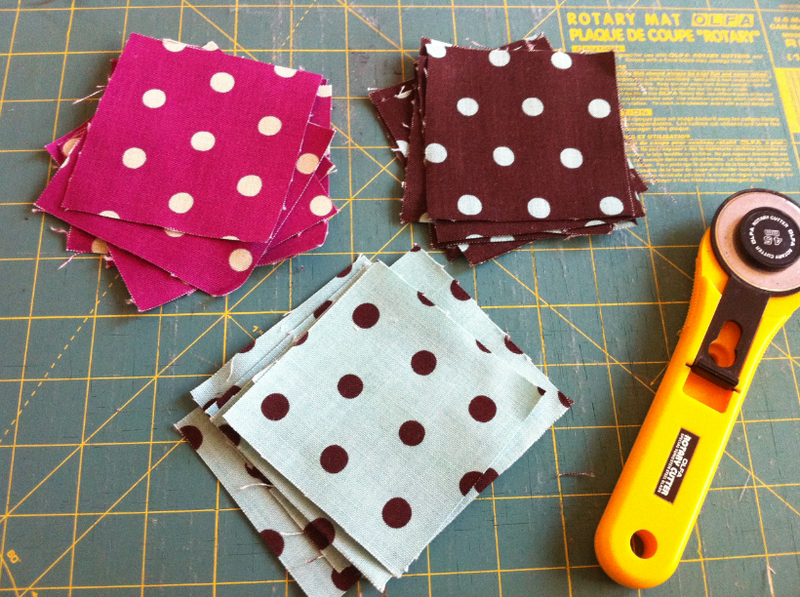 I, the patchwork rookie, got out a rotary cutter and a ruler to hone my cutting and sewing skills. I wasn’t ready to take on a complicated project (I have to work up to that) so I decided to make a simple, nine-square patchwork bag over the weekend. My goal was to take my time and cut each piece precisely, and sew it together with love and care, with an extra dose of patience. Instead of using 16 pieces (a total of 32 for both panels), I used nine on each side, with each piece measuring 3-1/2 inches x 3-1/2 inches (for ¼ inch sewing allowance). 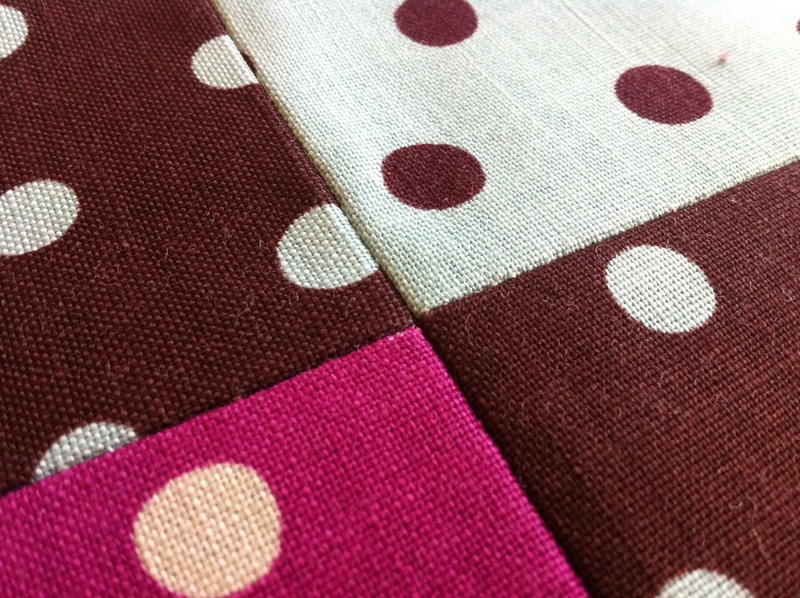 I used Echino‘s polka dots fabrics — the same ones that I used for the Lunch Bag I made a while back. I was incredibly happy when I saw that these edges aligned perfectly! What a feeling! Here’s the finished project! I put a cotton batting in between for a softer feel. Instead of a drawstring, I put a little magnetic closure inside, and turned the strap adjustable.